Our Constitutional Logic has identified the fundamental predicate of Government I, which operated, more or less, under Constitution I, the Constutiton of the year One, as a disposable government. 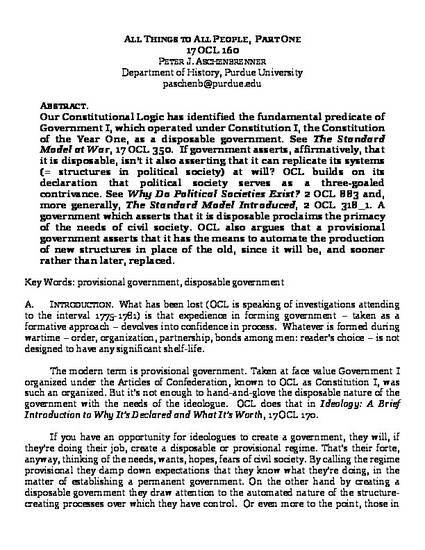 See The Standard Model at War, 17 OCL 350. if government asserts, affirmatively, that it is disposable, isn’t it also asserting that it can replicate its systems (= structures political society) at will? OCL builds on its assertion of political society as a three-goaled contrivance. See Why Do Political Societies Exist? 2 OCL 883. Isn’t such a government asserting the primacy of the needs of civil society? By offering to dispose of its when and as necessary to further the larger purposes of civil society? And isn’t a provisional government asserting that it has the means to automate the production of new structures in place of the old?